Habitat: Grows wild on moist, well-drained soils, from Europe to Western Asia and Siberia. 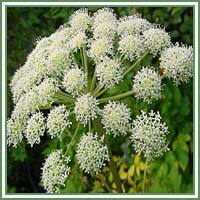 Description: Wild angelica is biennial, umbelliferous plant, grows to 2 meters. It has broad leaves, indented and pointed on coarse, tubular stem. Edges of leaflets are finely toothed. Flowers appear from July until September, grouped into wide flower clusters. They are green white in color. The root is long and thick, the outer side is dark brown, and the inside is white and juicy, with a sponge-like texture when dried. It flowers from July to September. Parts used: Root. After drying, the root has a characteristic, aromatic odor. 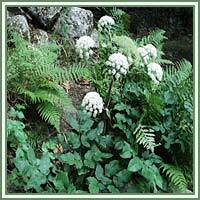 Medicinal use: The plant is very successful in treatments of digestive and respiratory conditions. It helps in cases of stomach aches, dyspepsia, flatulence, and urinary problems. It increases appetite, helps removing toxins from our body, and has shown to be very useful in treatment of skin diseases and rashes. Safety: The plant contains fero-coumarins, which increase skin sensitivity to sunlight, and therefore could cause dermatitis. Some herbs could react with certain medication. It is advisable to consult your doctor before consumption of any herb.